Fourth-quarter revenues of $10.0 million, with a 31% quarter-over-quarter increase in custom milling revenues. The Wasamac feasibility study is ongoing, with the Corporation expecting to release the results in early December. The Corporation has created a confidential virtual data room to provide access for parties that have expressed an interest in reviewing the data for the Wasamac project. Production results for the first quarter of fiscal 2019 can be found at the end of this release. 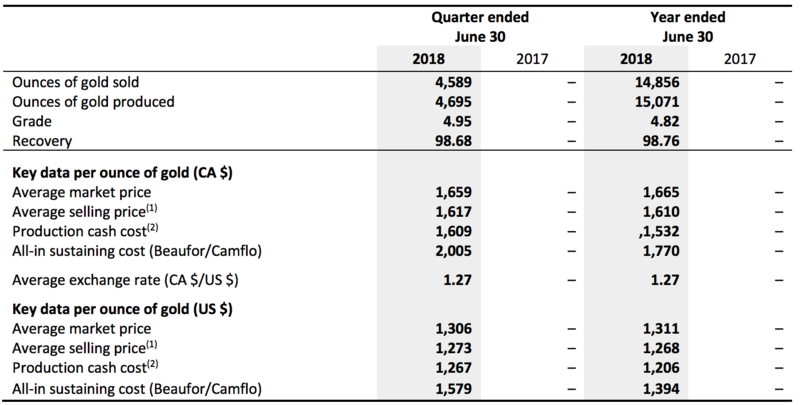 Montreal, Quebec, Canada, October 29, 2018 – MONARQUES GOLD CORPORATION (“Monarques” or the “Corporation”) (TSXV: MQR) (OTCMKTS: MRQRF) (FRANKFURT: MR7) is pleased to report its results for the fourth quarter and fiscal year ended June 30, 2018. Amounts are in Canadian dollars unless otherwise indicated. Production of 4,695 ounces in the fourth quarter, down 5% from 4,932 ounces in the previous quarter. Average selling price of $1,617 (US $1,273) per ounce ($1,610 or US $1,268 since the acquisition on October 2, 2017). Production cash cost of $1,609 (US $1,267) per ounce sold ($1,532 or US $1,206 since the acquisition on October 2, 2017). All-in sustaining cost of $2,005 (US $1,579) per ounce sold ($1,770 or US $1,394 since the acquisition on October 2, 2017). Revenues of $10.0 million in the fourth quarter from the sale of 4,589 ounces of gold combined with revenue from custom milling, which was up 31% quarter-over-quarter. Net loss of $2.8 million or $0.014 per share, diluted, compared to a net loss of $0.6 million or $0.004 per share, diluted, last year. Strong financial position, with $15.0 million in cash. “We are also continuing to move forward with our other advanced projects, including Croinor Gold and McKenzie Break, for which drill results will be released in the coming weeks. Croinor Gold continues to impress us with multiple high-grade results and continuity of the mineralization along strike and at depth,” Mr. Lacoste concluded. (1) The average selling prices for the 2018 three- and twelve-month periods would be $32 and $28 higher, respectively, if gold deliveries (861 ounces for the quarter and 2,583 ounces for the 12-month period) to Auramet in connection with deferred revenues for the periods had been recognized at market price on the date the agreement was entered into on October 2, 2017, instead of at the recorded price, representing the amounts received from future gold production divided by the ounces to be delivered. (2) Production cash cost is a non-IFRS measure of financial performance without a standard meaning under IFRS. It may therefore not be comparable to a similar measure presented by another company. See "Non-IFRS measures" in the Corporation's management discussion and analysis for the quarter ended June 30, 2018. On May 31, 2018, the Corporation announced that it has retained BBA to conduct a feasibility study for its Wasamac gold project (see press release). On July 19, 2018, the Corporation announced that it has filed a National Instrument 43-101 technical report for its McKenzie Break gold project on SEDAR (see press release). On August 3, 2018, the Corporation announced that it has filed a National Instrument 43-101 technical report for its Swanson gold project on SEDAR (see press release). On August 30, 2018, the Corporation announced that production activities at the Beaufor Mine will be temporarily suspended as of December 2018, and the mine will be placed on care and maintenance (see press release). On September 10, 2018, the Corporation sold its 30% interest in the Chimo property to Chalice Gold Mines Limited (“Chalice”) in consideration of 3 million fully-paid ordinary Chalice shares (see press release). On October 5, 2018, the Corporation announced that it has acquired a 2% net smelter royalty (“NSR”) on the Chimo-Boyd claims in exchange for the issuance of 170,000 common shares of Monarques at a price of $0.28 per share and a cash payment of $8,400 (see press release). On October 9, 2018, the Corporation announced that it has received conditional approval from the Toronto Stock Exchange to list the Corporation's common shares, subject to compliance with all exchange requirements by December 30, 2018 (see press release). Monarques produced 3,604 ounces of gold in the first quarter, down 23% from 4,695 ounces the previous quarter. The Corporation recorded revenues of $7.8 million in the first quarter, based on an average gold price of $1,520 per ounce (US $1,162) and the sale of 3,272 ounces, combined with revenues from custom milling operations, which increased by more than 8% during the quarter.